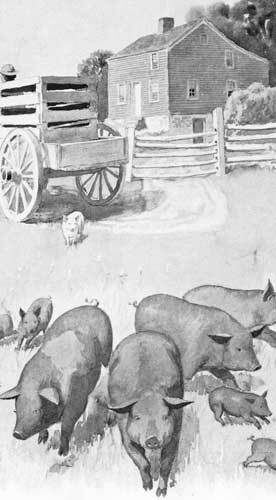 The Lonely Little Pig was published in Clara D. Pierson's collection, Among the Farmyard People (1899). If only children would remember their mama's lessons like this young pig does. One day the Brown Hog called to her twelve young Pigs and their ten older brothers and sisters, "Look! look! What is in that cage?" The twenty-two stubby snouts that were thrust through the opening of the rail-fence were quivering with eagerness and impatience. Their owners wished to know all that was happening, and the old mother's eyes were not so sharp as they had once been, so if the Pigs wanted to know the news, they must stop their rooting to find it out. Bits of the soft brown earth clung to their snouts and trembled as they breathed. "It looks like a Pig," they said, "only it is white." "It is a Pig then," grunted their mother, as she lay in the shade of an oak tree. "There are white Pigs, although I never fancied the color. It looks too cold and clean. Brown is more to my taste, brown or black. Your poor father was brown and black, and a finer looking Hog I never saw. Ugh! Ugh!" And she buried her eyes in the loose earth. The Pigs looked at her and then at each other. They did not often speak of their father. Indeed the younger ones did not remember him at all. One of the Cows said he had such a bad temper that the farmer sent him away, and it is certain that none of them had seen him since the day he was driven down the lane. While they were thinking of this and feeling rather sad, the wagon turned into their lane and they could plainly see the Pig inside. She was white and quite beautiful in her piggish way. Her ears stood up stiffly, her snout was as stubby as though it had been broken off, her eyes were very small, and her tail had the right curl. When she squealed they could see her sharp teeth, and when she put her feet up on the wooden bars of her rough cage, they noticed the fine hoofs on the two big toes of each foot and the two little toes high on the back of her legs, each with its tiny hoof. She was riding in great style, and it is no wonder that the twenty-two Brown Pigs with black spots and black feet opened their eyes very wide. They did not know that the farmer brought her in this way because he was in a hurry, and Pigs will not make haste when farmers want them to. The Hogs are a queer family, and the Off Ox spoke truly when he said that the only way to make one hurry ahead is to tie a rope to his leg and pull back, they are so sure to be contrary. "She's coming here!" the Brown Pigs cried. "Oh, Mother, she's coming here! We're going to see the men take her out of her cage." The old Hog grunted and staggered to her feet to go with them, but she was fat and slow of motion, so that by the time she was fairly standing, they were far down the field and running helter-skelter by the side of the fence. As she stared dully after them she could see the twenty-two curly tails bobbing along, and she heard the soft patter of eighty-eight sharp little double hoofs on the earth. "Ugh!" she grunted. "Ugh! Ugh! I am too late to go. Never mind! They will tell me all about it, and I can take a nap. I haven't slept half the time to-day, and I need rest." Just as the Mother Hog lay down again, the men lifted the White Pig from the wagon, cage and all, so she began to squeal, and she squealed and squealed and squealed and squealed until she was set free in the field with the Brown Pigs. Nobody had touched her and nobody had hurt her, but it was all so strange and new that she thought it would make her feel better to squeal. When she was out of her cage and in the field, she planted her hoofs firmly in the ground, looked squarely at the Brown Pigs, and grunted a pleasant, good-natured grunt. The Brown Pigs planted their hoofs in the ground and grunted and stared. They didn't ask her to go rooting with them, and not one of the ten big Pigs or the twelve little Pigs said, "We are glad to see you." There is no telling how long they would have stood there if the Horses had not turned the wagon just then. The minute the wheels began to grate on the side of the box, every Brown Pig whirled around and ran off. The poor little White Pig did not know what to make of it. She knew that she had not done anything wrong. She wondered if they didn't mean to speak to her. At first she thought she would run after them and ask to root with them, but then she remembered something her mother had told her when she was so young that she was pink. It was this: "When you don't know what to do, go to sleep." So she lay down and took a nap. The Brown Pigs did not awaken their mother, and when they stopped in the fence-corner one of them said to their big sister, "What made you run?" "And why did you run?" the little Pigs asked their big brother. After a while somebody said, "Let's go back to where the White Pig is." "Oh, no," said somebody else, "don't let's! She can come over here if she wants to, and it isn't nearly so nice there." You see, they were very rude Pigs and not at all well brought up. Their mother should have taught them to think of others and be kind, which is really all there is to politeness. But then, she had very little time left from sleeping, and it took her all of that for eating, so her children had no manners at all. At last the White Pig opened her round eyes and saw all the Brown Pigs at the farther end of the field. "Ugh!" said she to herself, "Ugh! I must decide what to do before they see that I am awake." She lay there and tried to think what her mother, who came of a very fine family, had told her before she left. "If you have nobody to play with," her mother had said, "don't stop to think about it, and don't act as though you cared. Have a good time by yourself and you will soon have company. If you cannot enjoy yourself, you must not expect others to enjoy you." "That is what I will do," exclaimed the White Pig. "My mother always gives her children good advice when they go out into the world, and she is right when she says that Pigs of fine family should have fine manners. I will never forget that I am a Yorkshire. I'm glad I didn't say anything mean." So the White Pig rooted in the sunshine and wallowed in the warm brown earth that she had stirred up with her pink snout. Once in a while she would run to the fence to watch somebody in the lane, and before she knew it she was grunting contentedly to herself. "Really," she said, "I am almost having a good time. I will keep on making believe that I would rather do this than anything else." The big sister of the Brown Pigs looked over to the White Pig and said, "She's having lots of fun all by herself, it seems to me." Big brother raised his head. "Let's call her over here," he answered. "Oh, do!" cried the twelve little Pigs, wriggling their tails. "She looks so full of fun." "Call her yourself," said the big sister to the big brother. "Ugh!" called he. "Ugh! Ugh! Don't you want to come over with us, White Pig?" You can imagine how the White Pig felt when she heard this; how her small eyes twinkled and the corners of her mouth turned up more than ever. She was just about to scamper over and root with them, when she remembered something else that her mother had told her: "Never run after other Pigs. Let them run after you. Then they will think more of you." She called back, "I'm having too good a time here to leave my rooting-ground. Won't you come over here?" "Come on," cried all the little Pigs to each other. "Beat you there!" They ate and talked and slept together all afternoon, and when the Brown Hog called her children home, they and the White Pig were the best of friends. "Just think," they said to their mother, "the White Pig let us visit her, and she is just as nice as she can be." The White Pig in her corner of the pen heard this and smiled to herself. "My mother was right," she said; "'Have a good time alone, and everybody will want to come.'" Add The Lonely Little Pig to your own personal library.